The Spectrum Tactonics Fund is a new innovation in Mutual Funds that combines lower risk with potentially higher returns, a fusion of technology and investment methodology that could change the scope of global mutual fund investing. They are open-end mutual fund trusts that are listed and traded on major stock exchanges. In Canada, the largest ETF is the i60 (XIU – TSE) which invests in the top 60 companies in the TSE. On their own, these exchange traded units are higher risk than stock-indexed mutual funds (the Canadian Index Funds usually cover strictly the TSE300 – they have a broader range and therefore are slightly lower risk than individual ETFs). There are also respective units for the NASDAQ and the Standard and Poor's (US indices). Until recently, there were relatively few ETFs; currently there are more than 100 listed on North American Exchanges. Tactonics is innovative because it uses a computer model to help make investment decisions relating to the portfolio. The two main factors that the model takes into consideration are Winner Persistence – the tendency for outperforming stocks, industries, countries or investment styles to continue outperforming and �Risk Metrics' – which provides indicators when a particular sector has moved to a level where a steep decline is becoming very likely. This would trigger a reduction or sell signal designed to reduce the position in a specific sector before the decline occurs. Why a computer model? It can handle large quantities of data without the emotional ties getting in the way. As we have mentioned in previous issues, emotional investing can be hazardous to your portfolio. Ex: Spectrum ran their computer model over the last 5 years to see what type of returns the fund may have generated. Their data showed that the fund would have reduced their position in QQQ (Nasdaq's ETF) significantly when it was overvalued in December 1999, prior to the drop. The main benefit of investing in this fund is that it provides broad diversification through the use of ETFs which may be difficult or very costly to attain otherwise (if done on your own by purchasing ETFs). They also are subject to less volatility in the marketplace as a direct result of this diversification (see risk/return chart). 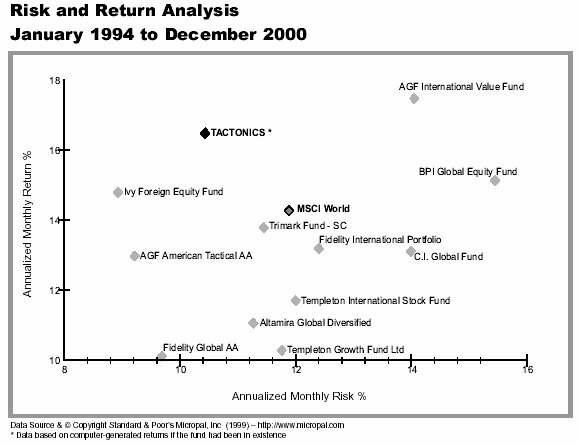 Tactonics also has a lower MER (Management Expense Ratio) than comparable mutual funds. Since the fund purchases ETFs and not individual stocks, this reduces transactional costs due to the fact that they wouldn't need to purchase as many positions as a typical equity mutual fund. The difference however can be minimal (about .25 %) depending on the other global fund in question. An ETF can provide swift entry and exit from a particular sector. It provides the managers of the fund more flexibility to move in and out of positions in order to take advantage of potential market opportunities. They are able to accomplish this since selling out of one sector would result in selling one ETF, which could represent 100 to 150 companies, rather than selling shares in 100 companies to get out of a sector. Who would benefit from this type of fund in their portfolio? We would recommend this fund as a compliment to existing foreign positions, for investors who are looking for a foreign position with a time horizon of at least five years and can handle some volatility. Although it is a less volatile fund than some other comparable �high risk' funds, it would still be classed in a higher risk category as some ETFs that the fund may hold may represent narrow and potentially risky market segments. The risk level would be reduced however by the aspect of diversification. Well, we compared this fund to one of our top recommended Higher Risk International Funds, the AGF International Value. We like this fund because of its strong track record, with consistent returns. Spectrum has stated that the AGF fund has a higher standard deviation than the Tactonics, which would make it more volatile and the fact that it is a value oriented fund means that it may underperform in narrow growth markets. To May 31st, AGF had a one year return of 28%, it has a history of producing similar returns to the MSCI World Index and has outperformed it over the past few months. Tactonics states that in their best year, based on computer generated data, they would have made 42% whereas in AGF's best year they made 40.5%. In summary, lower risk, with higher potential returns. The biggest one, no track record. This is a very new product that we will be monitoring closely. We may not jump to recommend it over other established foreign investments quite yet unless it is to be used as a compliment to your existing portfolio, especially if you are interested in Exchange Traded Funds. We will definitely keep Spectrum Tactonics as a Fund to Watch. If you are interested in seeing how this fund can tie into your existing portfolio, please contact us at 1-800-387-9273 and one of our Associates can help you or by e-mail at carl.spiess@scotiawealth.com. Trimark RSP Equity has recently changed its name to Trimark Canadian Endeavour Fund to better illustrate the objective of the fund, since most mutual funds with �RSP' in the name are foreign �clone' funds. The objective of the Trimark Cdn Endeavour Fund (which has not changed) is to invest in strong capital growth companies with a history of reliability over the long-term. Talvest Cdn Equity Leaders has a new lead manager at the helm. Talvest Fund Management has announced the appointment of Denis Ouellet as interim portfolio manager of Talvest Cdn Equity Leaders Fund. The temporary fund manager change will not affect the mandate of the fund.